MUNICH, GERMANY (January 26, 2014) — Union Binding Company is honored to receive the ISPO Product of the Year award in the action segment for its new Forged FC Binding. Developed in close cooperation with Automobili Lamborghini Advanced Composite Structures Laboratory (ACSL), the Forged FC is the first binding ever to use Forged Carbon. 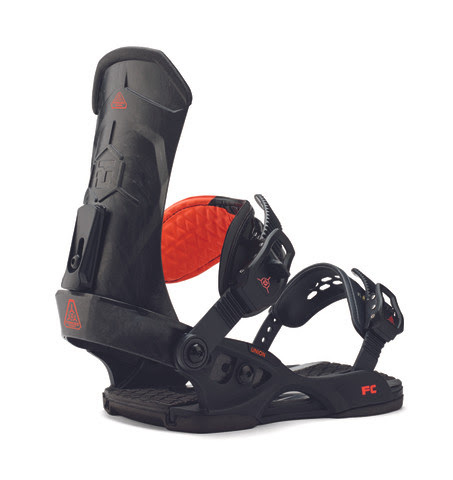 The material is the lightest and strongest on the market, delivering peak performing heelside response and control. "When we started this project, I was shocked by the intensity of the loads to which professional riders, like Travis Rice and Gigi Rüf, subject these bindings," said Paolo Feraboli, Ph.D, Director, Automobili Lamborghini ACSL. "Forged technology provides the best solution in terms of weight, stiffness and strength. We introduced all of our competence in carbon fiber and lightweight engineering into one stunning form to create the Union Forged Carbon product line." Ten years ago Union came onto the scene, and the brand has continually introduced innovative first-to-market materials. Union firmly stands by its original commitment to the evolution of snowboard bindings. The brand's team riders are constantly pushing the product's limits while redefining what is possible on a snowboard. Snowboarder magazine just recognized Union team riders Gigi Rüf as "Rider of the Year," and Jess Kimura as "Female Rider of the Year," and Justin Fronius as "Rookie of the Year." Union Binding Company is an independent brand based in Colico, Italy. Union is world renown for innovation and a product first mentality.